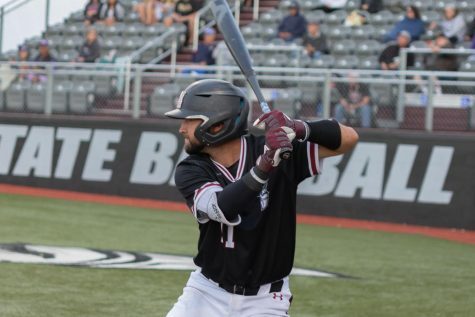 Through 15 games this season, the New Mexico State baseball team appears to have made another leap forward after having the nation’s biggest turnaround a year ago. 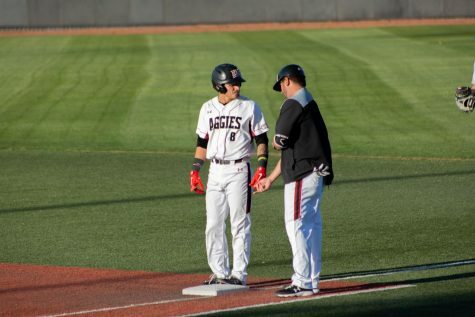 The Aggies are RECORD and lead the nation in a few offensive categories (Batting avg. (.366), hits (189), runs (155), OBP. (.462), doubles (38), and scoring (11.1)). 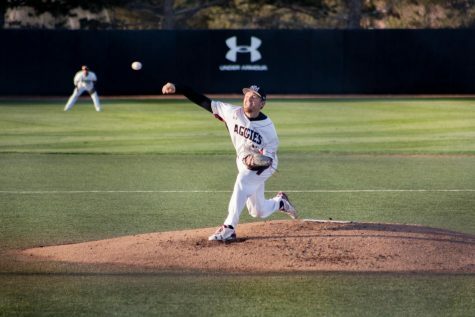 Having hosted the Yale Bulldogs in a four-game series in the last home series before a nine-game road trip, the Aggies dropped the series opener 3-1. 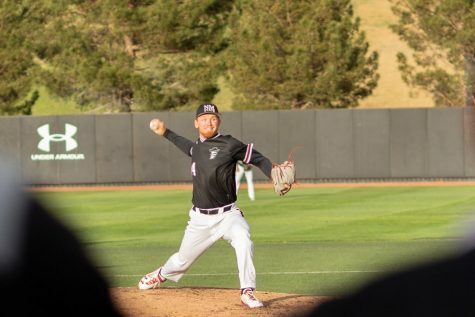 NMSU was held to a season-low five hits and could not capitalize on the solid outing from starting pitcher Jonathan Groff, who gave up just two earned runs in 6.1 innings pitched. 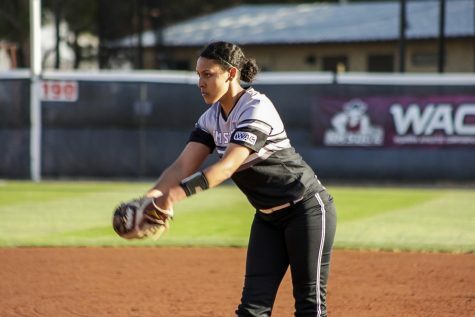 The Bulldogs could not keep the Aggie offense from getting going in the final three games of the series. 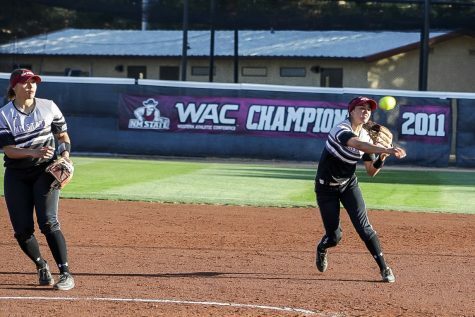 NMSU scored 41 runs over the next 27 innings and only struck out four times in 112 at bats. Senior Austin Botello lead the NCAA in hits with 26 and is third in RBI’s with 21. Winning the final three games of the series improved NMSU to 9-3 in their first 12 games at Presley Askew Field. It was a quick turnaround for the Aggies after the Yale series. The team made the 45-minute bus ride down to Southwest University Park in downtown El Paso two days later for the first of three games against I-25 rival New Mexico. The beautiful 9,500 seat home of the El Paso Chihuahuas (San Diego Padres Triple-A affiliate) hosted this game for the second-consecutive year to connect NMSU baseball to the borderland area (UTEP does not sponsor baseball). 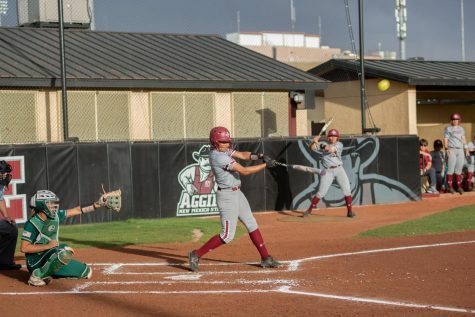 Last season, the Aggies knocked off the Lobos 9-6 in their only win in four tries against UNM. This time around, the Lobos wasted no time jumping on their southern rivals, scoring the game’s first three runs and holding the potent Aggie offense to just a couple of runs in the game in the 8-2 UNM win. The problem was not hits or getting people on base for NMSU (9-6), because they collected 12 hits as a team. 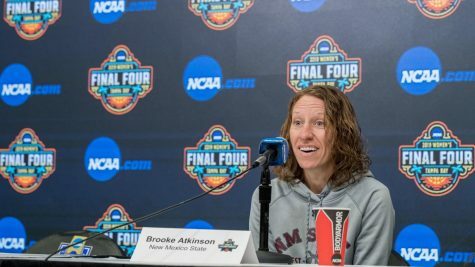 It was stringing together a rally that the Aggies had trouble with. 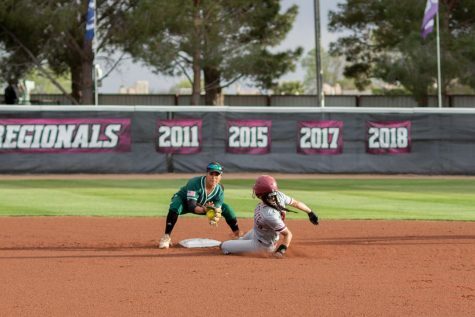 The Aggies scored seven hits with two outs, which puts pressure on the defense, but also takes away any chance of sacrifice hits. UNM (8-3) went into the game with the nation’s third-best RPI and were solid in all facets of the game. The Lobo defense did not commit an error the entire game and used seven different pitchers in the game, while the Aggies used nine. First baseman Jack Zoellner went 3 for 4 an RBI to lead the UNM offense, while Andre Vigil and Robby Campillo both registered a couple of hits each for the Lobos. Botello played a hand in both Aggie runs. With the bases loaded in the bottom of the 5th inning and the bases loaded, Botello was hit by the first pitch he saw, scoring Brian Kiser. Two innings later, Botello reached on a fielder’s choice that lead-off man Marcus Still. 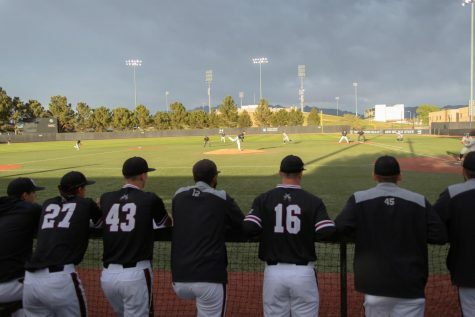 Head Coach Brian Green used an army to get through the nine innings as the team was slated to head to Salt Lake City to play a three-game series with the Utah Utes. Dalton Shalberg saw the most action, going 2.1 innings and giving up three earned runs and four hits. It was still a good experience for the four El Paso natives on the NMSU roster (Matthew Perea, Mathew Munden, Alex Reyes, Dante Martinez) as well as a good opportunity to look at the Lobos before seeing them again on March 28 at Presley Askew Field.